1. Learning to speak memory. KIERKEGAARD WROTE, ‘YOU can only understand life backwards, but we must live it forwards.’ He is right. Understanding comes with hindsight, as does the personal resolution of many uncertainties, conflicts and misunderstandings. Many of us would like, in T.S. Eliot’s words, ‘To arrive where we started / And know the place for the first time.’ Yet how can we do this, how can we, to twist Nabokov’s title, ‘Speak Memory’? Let me first consider the problem at a general level. Alan Macfarlane. Click to enlarge. Recovering memories, the work which has made Proust and Wordsworth immortal, has concerned me much of my life as both an historian and anthropologist. Much academic work is actually about memory – anthropology, for instance, is about the ‘Remembered Village’ in S.N. Srinivas’ book title, and history is largely concerned with projecting ourselves back into past memories. All this is obvious in the case of novels, yet it is not so often realized in relation to social sciences and humanities, and, I suspect, the hard sciences as well. In this yearning, the period of childhood, particularly that most formative age before about thirteen, is the most difficult to retrace. It is particularly so if, as in my case, it was lived through the intensity of a boarding school education. How can one approach one’s past? ONE APPROACH MIGHT be to attempt to do an anthropological study of the process by intensive participant-observation. The holistic, intensive participant approach would be the best methodology to understand schools and childhood. I have attempted this both through filming and playing with children in Nepal and my grand-children in the west. One can go a little way into the mental and moral worlds of growing children. Yet there are obvious limitations. No-one, to my knowledge, has undertaken a real anthropological investigation of childhood. Malinowski defined the goal of anthropology as “To grasp the native’s point of view, his relation to life, to realize his view of the world.” In updated words, this might be our aim too in relation to childhood worlds. Yet it would appear to be impossible. By the time one is an adult, it is too late. One might get glimpses of the world of young children growing up by being a teacher or parent. Yet even with teachers and parents, most is invisible. One can get children to write diaries and answer questionnaires, as in Royston Lambert’s project.1 Yet this only scratches the surface. In order to do the job properly one would need to participate fully, to be inside the dormitories at night, play the games in the playground, see the world from the level of a growing child. This is clearly impossible for an adult for ethical and other reasons. SOMETHING CAN BE retrieved in this way and there are a number of moving and insightful accounts of childhood and education. Yet they all suffer from the defects that afflicts memory – namely that it is patchy and only recalls certain, usually the painful or otherwise special moments. I have found a number of observations of those who have thought about childhood memory give insights into these difficulties. It is worth quotingBenson, who writes so brilliantly about his childhood, a little more. THE PROBLEM OF recovering memory comes not only from the fact that one has forgotten so much, but also that what happened since has distorted one’s interpretation of what is remembered. We re-interpret past materials, whether written or oral, with the use of hindsight and hence distort the meaning. It is easy to be wise after the event and to allocate praise or blame, to smooth out contradictions or to find premonitions of later events. It seems to me that, as far as possible, it is important to refrain from retrospective speculations. It is also wise to refrain from the anachronistic practice of judging past times by the values of the present. It would be easy to condemn casual snobbery or racism, or just smugness and complacency in our past. This is unhelpful and often unfair unless we fully think ourselves back into a different age with its special pressures and assumptions. Yet for something more than a pure narrative (if such a thing could exist) the text needs some framework of interpretation, some hypotheses to lift it above the level of merely a set of loosely connected pieces of information. In my own case, I have tried to put my own childhood within the context of the two major over-arching changes of those years. One is the huge societal shift of the 1950s as the effects of the Second World War diminished. Our infancies were lived in the war and under the shadow of that war. The second is the rapid dismemberment of the British Empire begun in the decade after 1947. The largest empire in history was set free in an amazingly short time. This also altered the type of schooling we were starting to receive. There is also the problem of representativeness, which afflicts all anthropological and historical case studies. All one can do is to recognize the problem. Every life, every school, every village is special and different. Yet there may be deeper commonalities. For example, the work on which I am engaged, which is centrally about the Dragon School in Oxford, is an account of a rather special school. This has both advantages and disadvantages. It means that the school cannot be held to be representative of preparatory boarding schools of that time. On the other hand, the school appears to us to be interesting both in the way it was run and in the kind of pupils it recruited and what it made of them. THE DRAGON WAS founded on concepts which went against much of the educational philosophy of late Victorian imperial education, even if it also retained much of an earlier Edwardian tradition of boarding schools in which our teachers had been reared. Unlike St. Cyprian’s of the early twentieth century as describedby some ofits old boys, including Cyril Connolly and George Orwell, the school tried to overcome some of the traumas of this kind of socialization. It forms a bridge between the muscular Christian, imperialist, attitudes of the aftermath of Thomas Arnold through to our modern, post-imperial, world. It is also an interesting school because of the later distinction in a wide variety of fields of a considerable number of its former pupils. The Dragon has helped to shape our national life and it is now helping to educate new rulers who are sending their children to it from China, Japan, India and elsewhere. So the work can also be seen as a form of ‘magical realist’ writing. In such writing, which in a way is also the essence of anthropology, the humdrum realism of a prosaic and ‘natural’ world is made ‘magical’ and interesting in another place and time because the assumptions of those who encounter it elsewhere are so different. The world of the British Empire and my up-bringing will no doubt strike most people, whether in Africa, South America or China, as extraordinary even now. It is likely that in another century it will seem a magical and different world even to the British. My own childhood nearly sixty years ago is starting to take on a magical unreality – a foreign country where they do different things for different reasons. If that is so for me, how much more will it be for my great grandchildren or my friends from China or Japan? THUS THERE ARE many difficulties. Yet the opportunities are unparalleled and unprecedented. It is possible to envisage autobiographical and biographical voyages of a new kind. As is often the case, changes in technology have opened new doors and corridors. The past is suddenly becoming recoverable to a degree which was quite out of the question even ten years ago. This is the result of very recent developments of computers and the internet. In terms of the collection of materials to aid memory work, the internet makes an extraordinary difference. It enables us to find long-lost friends and family, and to share memories and exchange archives. It helps us locate an immense amount of concealed material in private and public collections, including censuses, wills, journals, letter collections, gazetteers and other sources. And if large sets of material are found (for example, in our case, thousands of letters in Cambridge University Library and the National Library of Scotland), they can be transferred by scans and microfilm to one’s own study. Without this, the research would be interminable and too expensive. At the stage of analysis, the new technologies also alter the game. As I explain below, e-mail and other electronic communications make possible forms of collaboration with others who are searching in the same past worlds, enriching the task enormously. Daily collaboration becomes possible with people anywhere in the e-world. Furthermore, computers, with their new information retrieval systems and databases, make it possible to handle the greatly expanded sets of materials which are now to hand. Without better ordering tools, it would be impossible to keep the large sets of information under control. Finally, the internet makes it all worth while. Antiquarian research just for oneself or one’s children may be fun, but the enjoyment is greatly increased if there is a possibility of sharing the results through wider publication to others. Yet these others are scattered all over the world and the desire to publish at length and in detail would be prohibitively costly with conventional publishing. New desktop and online publishing makes the project something new. Furthermore, the possibility of having layers of detail – a printed and published version, an electronic book, and then a database with much fuller materials for those who want to go deeper, is now available. We live in a new world where we can contemplate the work of memory in an age of electronic reproduction, to paraphrase Walter Benjamin’s well-known essay title. I have found that the best way to extract the memories, buried deep under a subsequent sixty years of accumulated sensations in my case, is to let them bubble up as they will – sometimes unprompted, at other times suddenly recalled.11 With me, it is my mother’s letters, my own letters and essays, various diaries, numerous photographs and even toys which jog my memory and force it to ‘speak’. So the work starts as a flow of consciousness, to be jotted down as things occur to me. In the famous ‘Art of Memory’ devised by the Romans, the technique was that of going on a walk in the mind through a remembered landscape, re-peopling it with faces, events and quotations. This is one way in which to start peopling memory. 1951: Dorset. Alan lower right. From Dorset Days (see below). Click to enlarge. FOR EACH OF the landscapes I explore in my life there are several paths, through the physical landscape (including sounds, smells, touch), the social landscape (the people who inhabited them, in particular my family and friends), the intellectual landscape (the things I was thinking and learning), the event landscape (the things that happened in each place and particularly strong impressions). While at first not much is remembered and it is an effort, as I proceed, as seems to have happened with Proust, the more one remembers the more it triggers other memories. William James’s description of how we remember, which fits with Galton and with Koestler and the ‘Art of Memory’ literature, suggests that what we do is to try to use mnemonic devices surrounding the object to bring it into view – the physical space, the objects, the people, the smells and sounds. This is what I have done for those most-difficult-to-remember first twelve or thirteen years of my life. Before I started I would have said that I could hardly remember anything. But when I sat down and started to write, turning over old letters and diaries, handling again the physical mementos, (toys, chocolate covers, photographs), as well as visiting remembered places and conversations (actual or electronic) with newly rediscovered friends, I found a rich soup of memories. THIS WRITING, LIKE like all intellectual work, is a long and complex journey. It is like anthropological fieldwork. At first one does not speak the language and one cannot understand much. But gradually the jumble of sensations start to fit into some simple patterns. As each jigsaw piece joins with another, so one can fit in others. It is not something one can force, though I think that Nabokov is right to say that concentration can sometimes retrieve things which we thought were lost. But mostly it is waiting calmly. It is all by association and when one gets into the frame of mind, as Proust realized, almost anything can bring back memories. For example, standing on King’s College Bridge one day watching small dace under the willows I suddenly remembered other willows and other dace of my childhood. The project is one of exploration, an ethnography of a past country and a past self – oneself when young and living in a vanished age. Yet one’s past is not totally lost or too distant. I can become a participant again – Wordsworth’s ‘emotion recollected in tranquillity’ – and also a more dispassionate observer. For I am now analysing it and trying to understand in a different way to that which when I was living it. 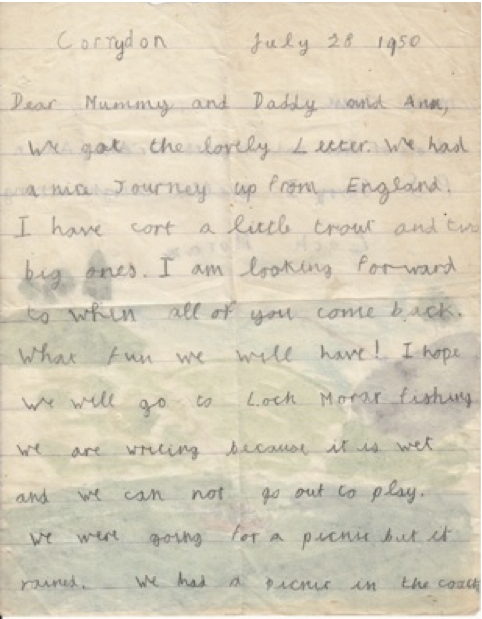 Letter written two months before leaving for the Dragon School. Click to enlarge. IN SEARCHING THROUGH my papers I have found over a hundred letters I wrote from the Dragon School. We were required to write each week, so there should have been at least 150 letters. To still have perhaps two-thirds of those I wrote (there are only five for my first year, but thereafter they are fairly complete) is encouraging. These are supplemented by another source which has seldom been integrated into a systematic study of letters from a boarding school. These are the letters from parents and grandparents to the child. These letters, written mainly by my motherbetween 1947 and 1955, are complemented by her detailed and observant letters to my father when they were apart (he was a tea planter in Assam) about her visits to me and my progress. My mother’s letters and other sources also allow me to reconstruct the context of home life while I was at the Dragon. I realized that we cannot understand a child in their boarding context without also understanding their family and home life. My life in the period between six and thirteen in the periods when I was not at the Dragon dovetailed with the school experience. It is described in a companion volume, which shows how much my experience and imagination bridged the two parallel worlds. These letters allow us to begin to enter the mind of the growing children, filtered of course by convention, reticence, assumptions about the interests of the receivers of the letters, yet nevertheless recording much of the daily life of childhood in a detail which it would be impossible to remember. They allow us to examine what struck the child at the time, what was significant, the biases and assumptions of childhood. The contemporary letters in two directions are supplemented by several other contemporary sources which give depth to the analysis. School reports are occasionally referred to in the literature on preparatory schools, but I know of no systematic analysis of an almost complete series relating to a child. I have the full termly reports for all but one of the fifteen terms I was at the school and also several dozen of the less detailed, but revealing, fortnightly reports which we sent home. A FURTHER SOURCE of relevant background is the unusually detailed accounts published in the termly school magazine, The Draconian. In particular, the ‘Term Notes’ by C.H. Jacques, which he later used as the basis for his Century History of the Dragon (1977), are insightful and amusing. They constitute a diary of the school while I was there. The ‘Term Notes’ are complemented by much else in the Draconian. For example there are accounts of debates, sermons, visits, plays, films, games, many of them extremely detailed, although they are of course written by and reflect the perceptions of the staff and not the Dragons. School report. Click to enlarge. A second thing I have found is how faulty memory is, not usually in the experience itself, but the surrounding details of when or where the event occurred or who was involved. 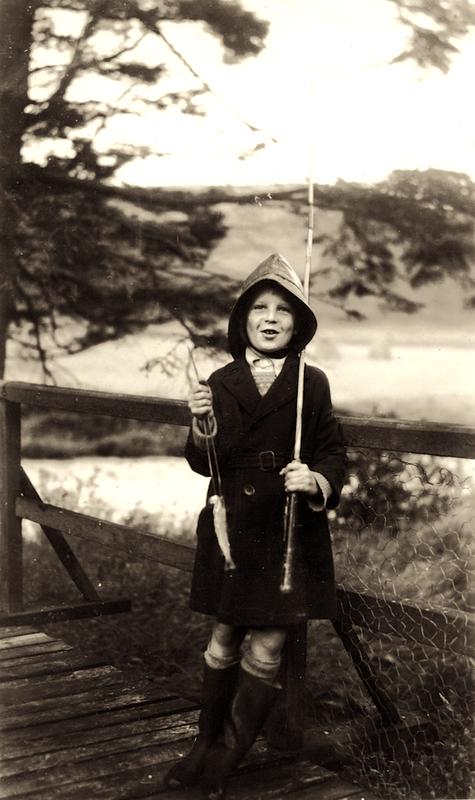 With the aid of documents I have re-contextualized many memories, when I caught my first fish, when I learnt to cycle, when I stole from my grandfather. I have also had to revise my whole assessment of the degree to which I was unhappy at the Dragon School. What I regret is that even with the detail in the documents, not a great deal of new memory has been triggered. I have sometimes managed to capture again the ambient smells, sounds and feelings surrounding a photograph or a letter. Yet very often I feel I may be forcing or imposing memories now that I know an event happened. For, on the whole, I can recall very little of even major events of that time, like going to India for my eleventh birthday holiday, or singing in Iolanthe when I was twelve. GAZING AT MY past as it unrolls in photos and comments it seems mainly to be the life of a slightly familiar stranger. I feel a little affinity, some ghostly overlap. Yet mostly it seems to be a different person. I recognize the little boy as someone I knew a very long time ago but have almost now forgotten. The past is not just a foreign country where they do things differently; it is inhabited by half-familiar ghosts of one’s younger self who seem disconnected strangers, yet are also part of oneself. Without the contemporary photographs, letters, diaries, school reports and other materials, I would be like an anthropologist who had done fieldwork in another society some sixty years ago and had destroyed all the fieldnotes. It would be an impossible task to write the ethnographic and anthropological account without the primary materials. Yet one needs constantly to remember that each of the sources is biased. Just to take one example, an over-riding first impression is of how insular the letters were. While Indian Independence and its aftermath rocked India, the Cold War and the Korean War rekindled fears of nuclear war in the late 1940s and early ’50s, these events, let alone the two elections which took place in Britain, are hardly mentioned. Yet I soon realized that along with a slightly head-in-the-sand attitude which my mother admits to, there were also good reasons for this. Personal letters and diaries are not usually where you will find discussion of international or national politics or events – unless they directly impinge on plans. This is worth remembering. The sources I have, like all historical documents, create a bias – in this case away from the general to the particular. As for letters written from school by young boys, there are, of course, many distortions and omissions in such a source. Included in the book is a chapter which mainly consists of a detailed analysis of classmates’ letters – from Jamie Bruce Lockhart and his brother, Sandy – to show in terms of silence and revelation how a boarder’s approach to writing letters home appears to evolve trough a preparatory school career. Addressing an adult, especially when one is still learning to control language, can lead into a kind of writing which conceals as much as it shows. THE ACCOUNT ABOVE describes the first year of my journey; it was as far as I could go. Even with a set of contemporary letters and other materials, a reader may well wonder what biases are created by seeing the past through one pair of eyes. How far are the impressions and memories the result of a particular personality and how far they correspond to a wider reality? Furthermore, I do not remember much with great clarity and in particular I do not have a strong visual memory. These two defects have been partially corrected by an accident. 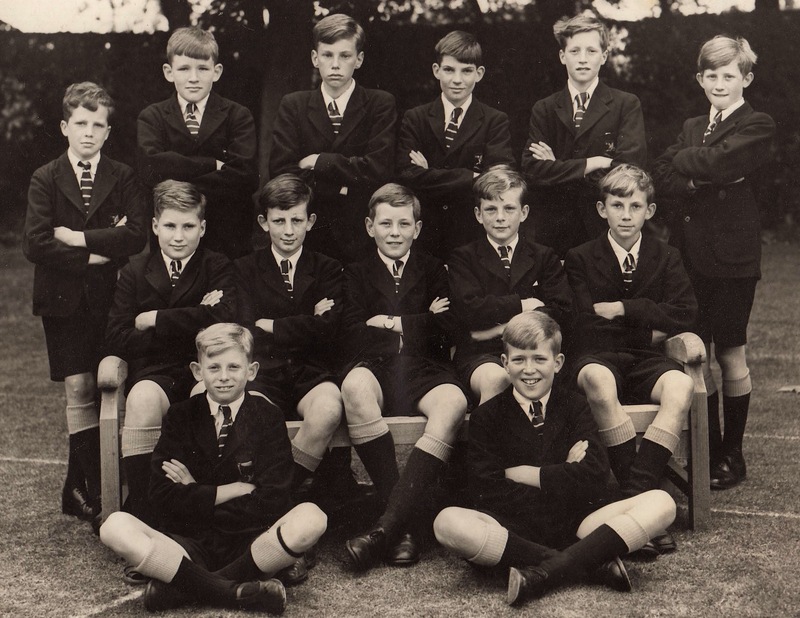 In March 2010 I hosted a re-union of ‘Old Sedberghians’ at King’s College, Cambridge. I received apologies from Jamie Bruce Lockhart and contacted him. Jamie had been one year ahead of me at the Dragon, but hisyounger brother Sandy was one of my closest friends at the school. Both Jamie and Sandy had shared with me the experience of being at the Dragon and then going on toSedbergh. 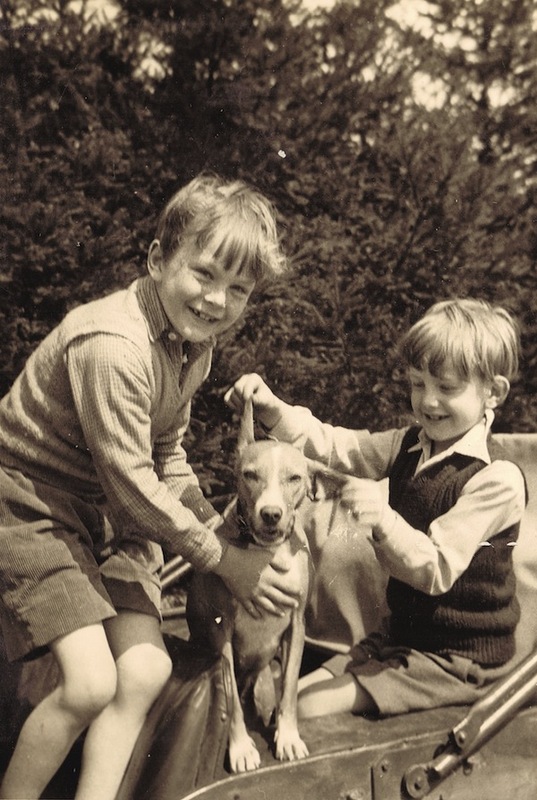 It turned out that Jamie had been jotting downsome of his own memories of his early life, for his family, and agreed to see whether he and I(Sandy had died in August 2008) could pool our memories and efforts. Thus began the collaboration on which this book is based. 1949: Jamie, Amber, Sandy. Click to enlarge. JAMIE FIRST WROTE all that he could remember of the Dragon – again a fairly short essay – before looking at the headings of the sections under which I had been writing.These headings acted as triggers to many further memories. Jamie’s memory is both stronger, and more visual (as a painter) and the account was in some aspects richer than Alan’s original. But for a while the memory account was kept separate so as to avoid cross-contamination. Jamie then started to read my full version and responded to it in detail. For a while, he was convinced that the letters he and Sandy had written from the Dragon to his parents had been lost. Perhaps this was behind his feeling that it was dangerous to tinker with memory by using external historical documents which would overlay the memories. Cricket 2nd XI for Summer 1954. Alan, far left; Jamie, second from right, on the bench. Click to enlarge. Unfortunately there were no letters from Jamie’s parents or his grandparents to him or Sandy, but the quality of the letters sent home by the two Dragons, as we shall see in the finished volumes, was unusual. 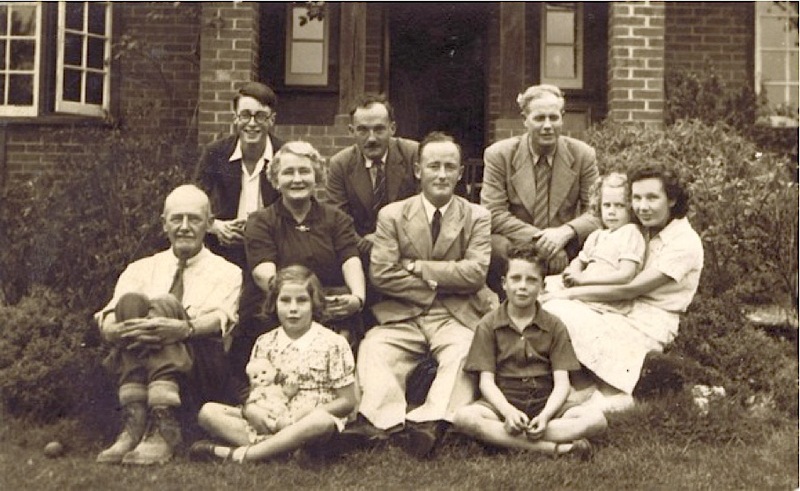 The discovery meant that we now had over three hundred letters from three little boys, plus a considerable number from my mother, both to me and to her husband in India. With this mass of data the next question washow to collaborate on the large and delicate task of mixing memory with text. The work was done over the following year, during which time we both continued writingabout our parallel home lives. The details of how we worked are recorded in an extensive email correspondence on all aspects of Dragon Lifeand reflect a rare intellectual collaboration in the revival of memories and joint analysis of schoolboy years. 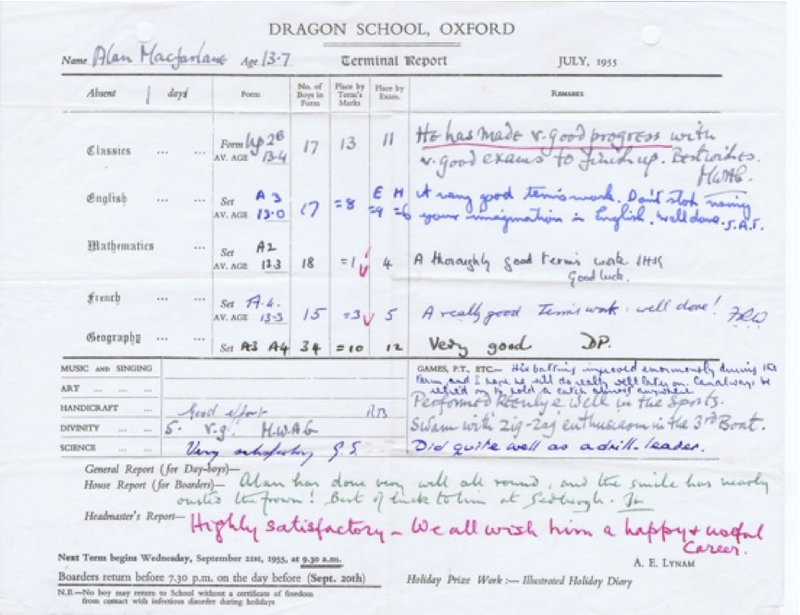 THE RESULTS OF this first voyage, Dragon Days: Education at an English Preparatory School, the Dragon School, Oxford, covering the period 1947-1955, between the ages of six to thirteen, is published this month. Yet this is just one part of the memory voyage, for those important years can only really be understood within a planned longer trajectory. The Indian roots of my family back into the late eighteenth century will form the first volume. Then, after the preparatory school education here recounted, comes the public school period and life in Wordsworth’s childhood valley in the Lake District. Then there are three enchanted years reading history at Oxford in 1960-3 where love, religion and intellectual excitement blended. After further years in Oxford and London University I hope to make more explorations through memory and history. Those doors will open later. Alan Macfarlane is an anthropologist and historian and a Professor Emeritus of King’s College, Cambridge. He is the author or editor of 20 books and numerous articles on the anthropology and history of England, Nepal, Japan and China. Much of his work has focused on comparative study of the origins and nature of the modern world. In recent years he has become increasingly interested in the use of visual material in teaching and research. He is a Fellow of the British Academy and the Royal Historical Society. His essay, “Concepts of Time and the World We Live In” was published the The Fortnightly Review in 2010, and his book The Invention of the Modern World appeared in serial form in The Fortnightly Review in 2012. This Fortnightly Review article is filed under the following rubrics: Biography and Memoir, History & Travel, Principal Articles. Publication: Saturday, 10 March 2012, at 10:38. ‹ A copper waste basket by Lawrence Weiner.